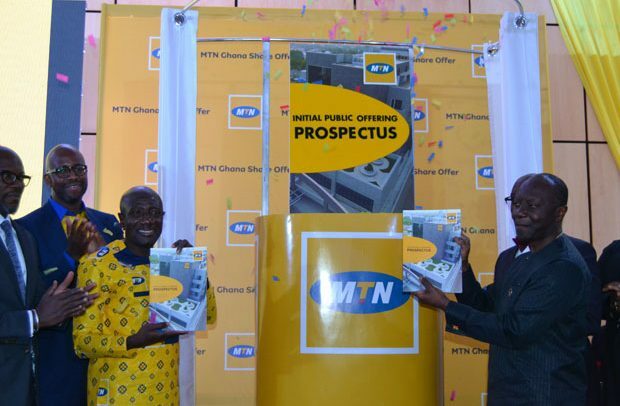 MTN Ghana yesterday launched its Initial Public Offering (IPO) to raise GH¢3.47 billion. The offer, which comprises 4,637,394,533 ordinary shares, representing 35 percent of its holdings, is on sale at 75 pesewas each. The IPO is expected to end on July 31 after which the company would probably list on the Ghana Stock Exchange on September 5, 2018. The event was attended by officials of the Securities and Exchange Commission (SEC), Ghana Stock Exchange (GSE) and Ghana Investment Promotion Council (GIPC). Ebenezer Asante, Chief Executive Officer (CEO) of MTN Ghana, indicated that the IPO forms part of the 4GLTE licence requirement which was launched in June 2015. “MTN Ghana is happy to fulfill its promise of encouraging Ghanaians in this front to be part of its holdings through very affordable rates for every Ghanaian to participate,” he remarked. Mr Asante indicated that MTN, which started in 1996 with about 2.5 million subscribers, currently has 17 million subscribers, indicating that the company, which has great passion to introduce innovative packages to meet the needs of its numerous customers, has emerged as a market leader. In 2017, MTN Ghana paid $4.4 million (GH¢19.6 million) as commission to retailers and agents while it paid GH¢1.218 billion as taxes to the State during the same period. He disclosed that the company has earmarked about $144 million to invest in CAPEX only, adding that its business division has rolled out fibre to over 14,000 homes within a year. Launching the IPO, Ken Ofori-Atta, Minister of Finance, commended MTN Ghana for being the first company in the telecom industry to take such initiative. He reiterated the commitment of government to creating a new business paradigm that would help businesses to flourish and create more job opportunities.